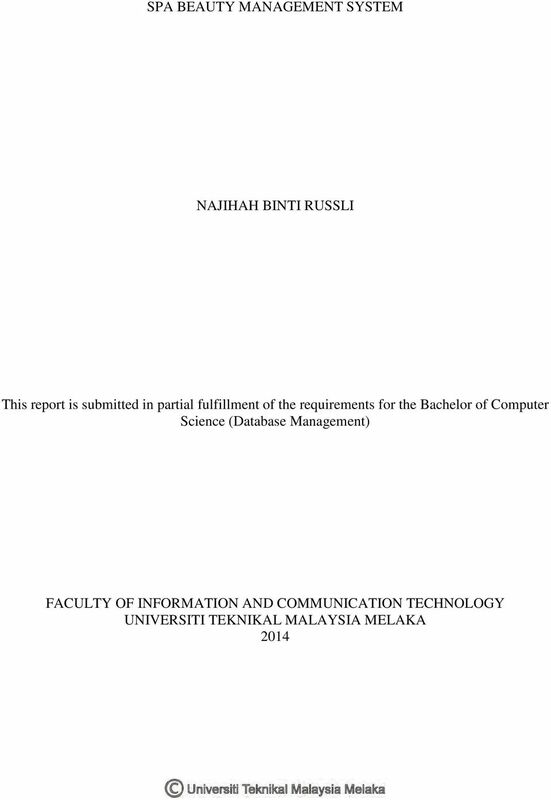 Download "SPA BEAUTY MANAGEMENT SYSTEM NAJIHAH BINTI RUSSLI"
3 BORANG PENGESAHAN STATUS TESIS JUDUL: SPA BEAUTY MANAGEMENT SYSTEM SESI PENGAJIAN: SEMESTER 2013/2014 Saya NAJIHAH BINTI RUSSLI mengaku membenarkan tesis (PSM) ini disimpan di Perpustakaan Fakulti Teknologi Maklumat dan Komunikasi dengan syarat-syarat kegunaan seperti berikut: 1. 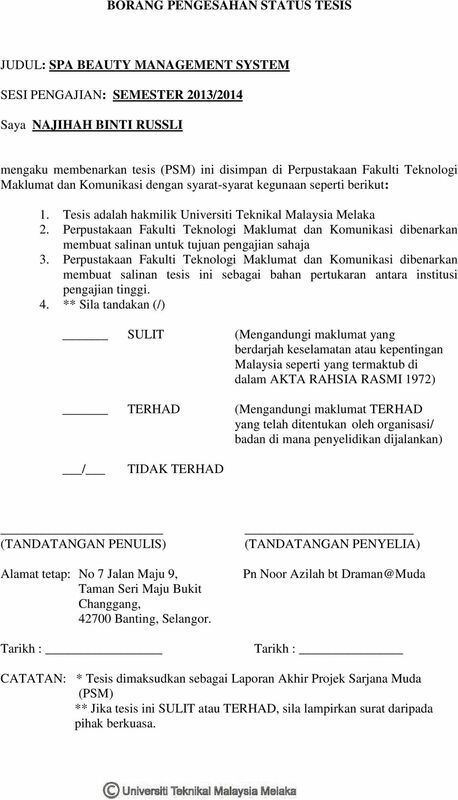 Tesis adalah hakmilik Universiti Teknikal Malaysia Melaka 2. Perpustakaan Fakulti Teknologi Maklumat dan Komunikasi dibenarkan membuat salinan untuk tujuan pengajian sahaja 3. Perpustakaan Fakulti Teknologi Maklumat dan Komunikasi dibenarkan membuat salinan tesis ini sebagai bahan pertukaran antara institusi pengajian tinggi. 4. ** Sila tandakan (/) SULIT (Mengandungi maklumat yang berdarjah keselamatan atau kepentingan Malaysia seperti yang termaktub di dalam AKTA RAHSIA RASMI 1972) TERHAD (Mengandungi maklumat TERHAD yang telah ditentukan oleh organisasi/ badan di mana penyelidikan dijalankan) / TIDAK TERHAD (TANDATANGAN PENULIS) Alamat tetap: No 7 Jalan Maju 9, Taman Seri Maju Bukit Changgang, Banting, Selangor. 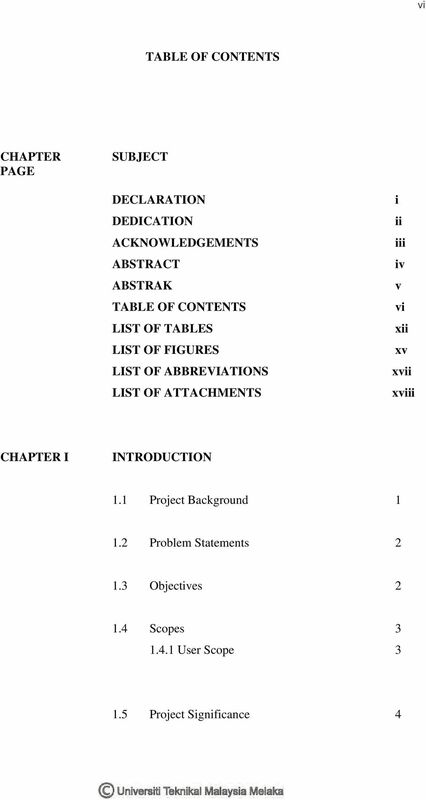 Tarikh : (TANDATANGAN PENYELIA) Pn Noor Azilah bt Tarikh : CATATAN: * Tesis dimaksudkan sebagai Laporan Akhir Projek Sarjana Muda (PSM) ** Jika tesis ini SULIT atau TERHAD, sila lampirkan surat daripada pihak berkuasa. 5 ii DEDICATION In the name of Allah, Alhamdullilah, I have done complete this project successfully. First of all, dear my beloved parents Russli Bin Basir and Zarina Bt Mat Ali, thank you for your support and help me much in everything. 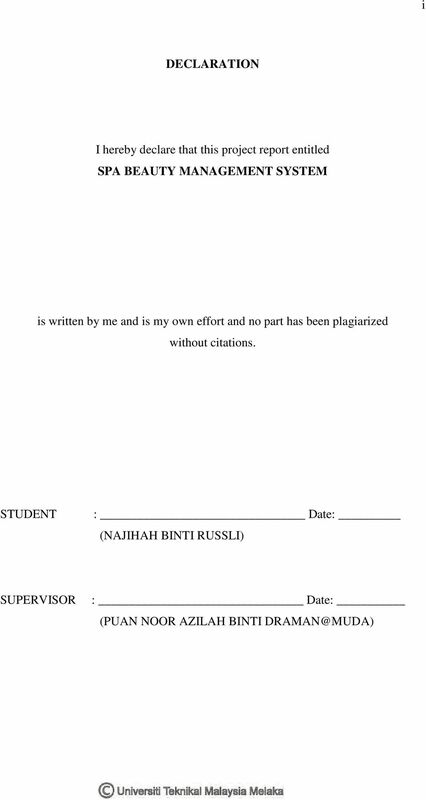 To my beloved supervisor, Puan Noor Azilah, thank you very much for everything. So many knowledge that I learned from you. Thanks for your patience. May Allah ease your way. To my lecturers thank you also for the helping and give the knowledge. And to my friends of BITD, who gives me support and knowledge sharing to complete this project. Thank you very much. Thank you so much. 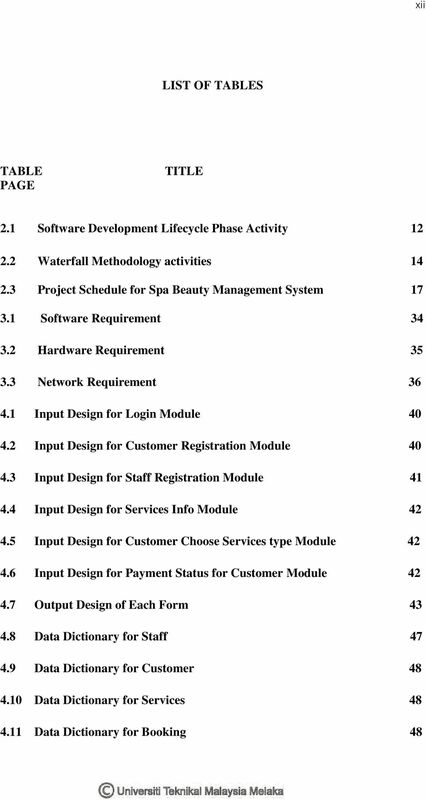 6 iii ACKNOWLEDGEMENT Grateful to God with His gift of His grace, we can also complete this final project of Spa Beauty Management System successfully without any problems. We also wish to express our appreciation and gratitude to the supervisor of this project, Puan Noor Azilah Bt for her guidance, motivation, knowledge, patience and encouragement given during the period of project implementation. My sincere thanks also go to my friends for their continuing supports and encouragement all the way to accomplish my project especially my classmate in UTeM who always give moral support when I was discouraged. I am grateful to my beloved family for their patience, and always supporting me throughout my life. Thank you. 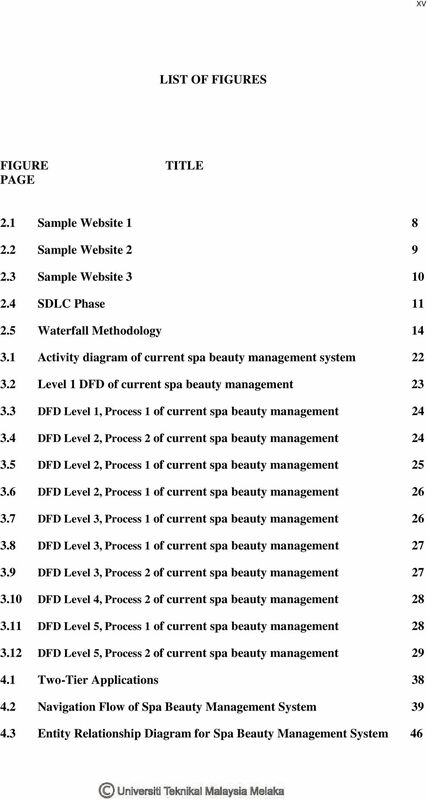 7 iv ABSTRACT Spa Beauty Management System was build to easier staff or administration to manage some module such as staff registration, customer registration, services, booking and payment that occur at Spa Beauty Centre. This system was create to overcome and update the previous system which used manual method and writing report on report book to record all the registration, services, booking, and payment module that occurs. 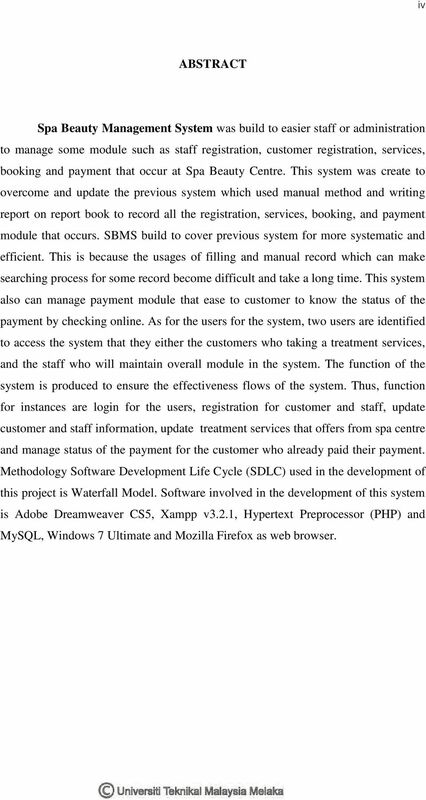 SBMS build to cover previous system for more systematic and efficient. This is because the usages of filling and manual record which can make searching process for some record become difficult and take a long time. This system also can manage payment module that ease to customer to know the status of the payment by checking online. As for the users for the system, two users are identified to access the system that they either the customers who taking a treatment services, and the staff who will maintain overall module in the system. The function of the system is produced to ensure the effectiveness flows of the system. Thus, function for instances are login for the users, registration for customer and staff, update customer and staff information, update treatment services that offers from spa centre and manage status of the payment for the customer who already paid their payment. 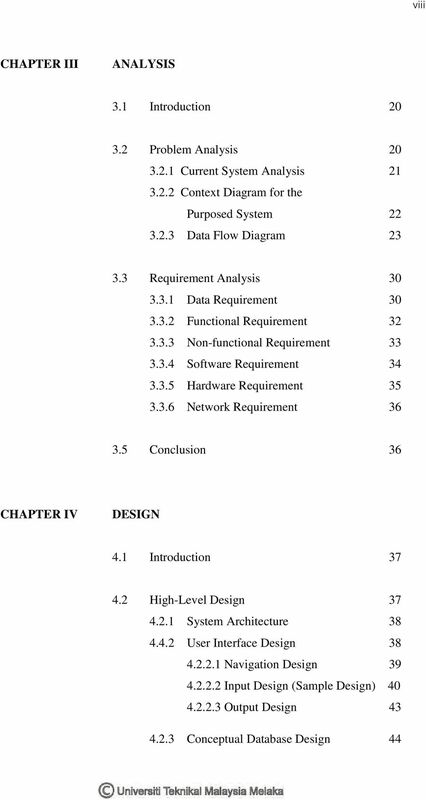 Methodology Software Development Life Cycle (SDLC) used in the development of this project is Waterfall Model. Software involved in the development of this system is Adobe Dreamweaver CS5, Xampp v3.2.1, Hypertext Preprocessor (PHP) and MySQL, Windows 7 Ultimate and Mozilla Firefox as web browser. 8 v ABSTRAK Spa Beauty Management System adalah satu sistem yang dibina khusus bagi memudahkan pengguna untuk menguruskan modul seperti pendaftaran staf, pendaftaran pelanggan, perkhidmatan, penempahan dan pembayaran yang berlaku di Spa beauty center. Sistem ini dibina bagi menambah baik sistem yang terdahulu yang menggunakan sistem fail atau rekod secara manual untuk mencatat segala maklumat mengenai urusan pendaftaran, servis dan bayaran yang telah dilakukan. Penggunaan sistem secara manual yang digunakan kelihatan lama dan tidak sesuai digunakan lagi pada masa kini. Spa Beauty Management System dibangunkan bertujuan menggantikan sistem pengurusan manual kepada sistem berkomputer yang lebih teratur dan efisien. Ini kerana penggunaan fail dan rekod secara manual akan menyebabkan penggunaan banyak ruang untuk menyimpan maklumat-maklumat tersebut dan akan mengakibatkan proses pencarian menjadi sukar dan mengambil masa yang lama. Sistem ini juga menguruskan modul pembayaran dengan mengemaskini status pembayaran yang telah dilakukan oleh pelanggan. Bagi pengguna sistem pula, dua pengguna telah dikenal pasti iaitu pelanggan iaitu pengguna yang akan menggunakan perkhidatan spa dan staf iaitu orang yang mengawal keseluruhan sistem ini. Fungsi sistem dihasilkan untuk memastikan keberkesanan aliran sistem. Oleh itu, fungsi login digunakan oleh pelanggan dan staf bagi mengakses sistem, pendaftaran bagi pelanggan dan staf, kemaskini maklumat pelanggan dan staff, mengemaskini servis rawatan yang ditawarkan oleh spa dan mengawal status pembayaran pelanggan. 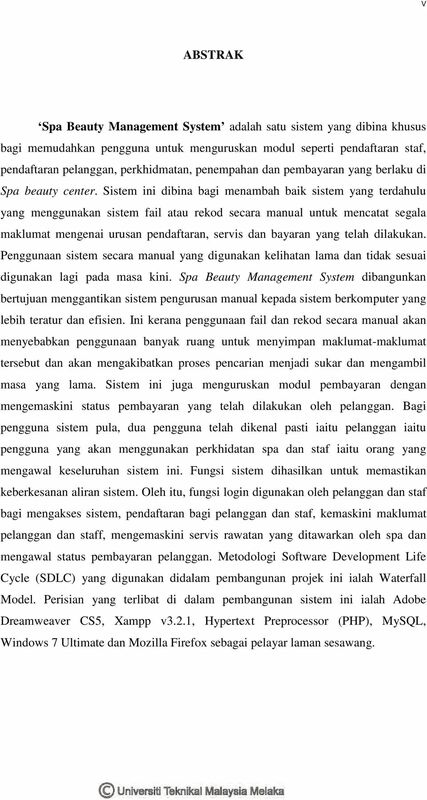 Metodologi Software Development Life Cycle (SDLC) yang digunakan didalam pembangunan projek ini ialah Waterfall Model. 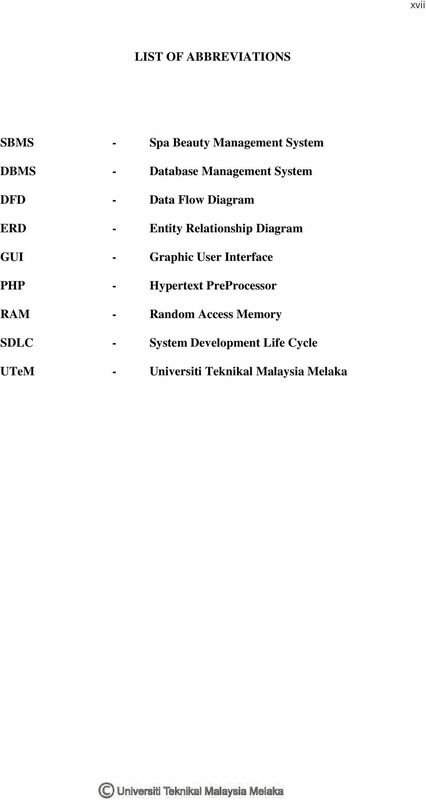 Perisian yang terlibat di dalam pembangunan sistem ini ialah Adobe Dreamweaver CS5, Xampp v3.2.1, Hypertext Preprocessor (PHP), MySQL, Windows 7 Ultimate dan Mozilla Firefox sebagai pelayar laman sesawang. 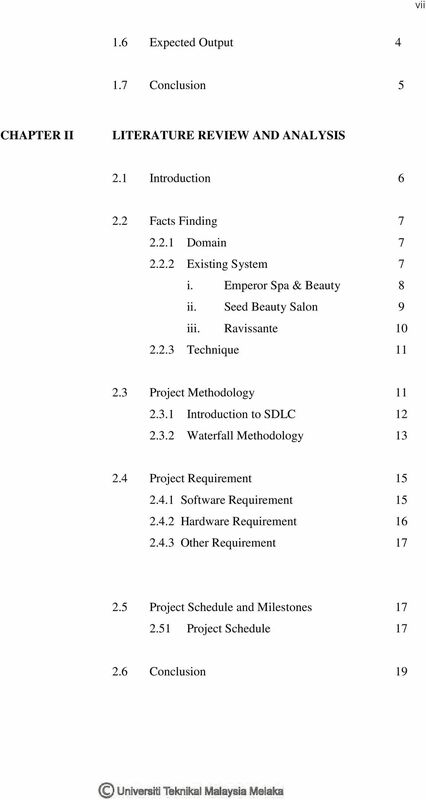 22 1 CHAPTER I INTRODUCTION 1.1 Project Background Spa Beauty Management System (SBSM) is an online system that offers spa beauty services and treatment. This Spa Beauty offers beauty and spa service included massage, make-up, sauna and hair treatment. Spa Beauty Management System is an online system that is basically specializes on managing the spa beauty management. It is an online system that the staff and management can manage management works. Basically, this online system is a system that facilitates staff to manage the data of the customers, services, product and payment. The main function of this online system is to maintain product, services or treatment, staff and customer information which handles by staffs. However, the booking for treatment and spa purchases can only be managed by staff. Spa Beauty Management System (SBMS) is a computerized system which has been develops to replace the existing manual system. 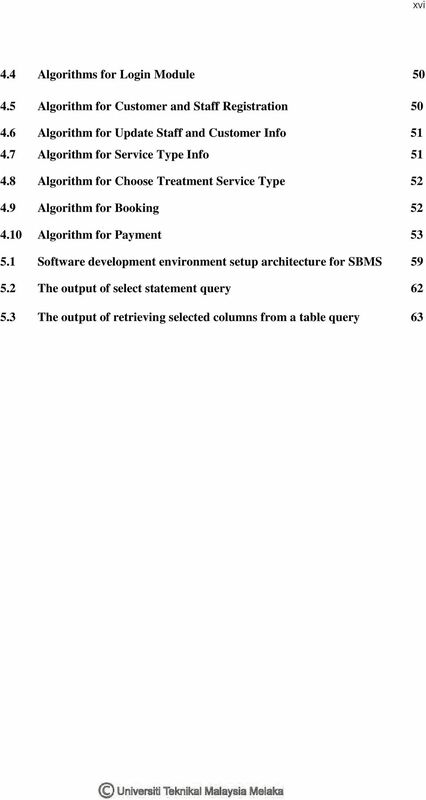 23 2 1.2 Problem statement(s) From the analysis that carried out in the organization, various problems have been identified. 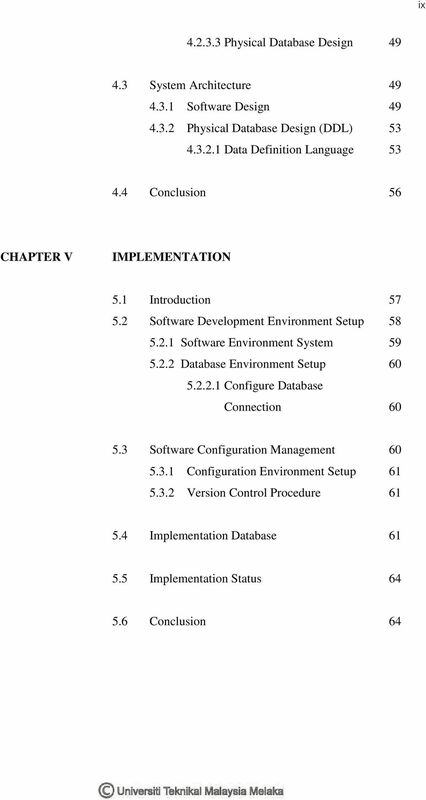 Basically these problems arise when the organization used the manual system. The problems that been faced by the organizations are: The current manual system records all the data by using papers and log book. The data is kept in file. If those document are lost is the lost it will risk to some to staff and management and they cannot trace the data anymore. Customer need to go to the Spa Centre directly for treatment services. The appointment reservation also needs to carry out at the center. It will take time to search process data. The problem also occurs during the current system especially when certain customer data if there some information that need to be update or else. 1.3 Objective The objectives of this project are: To develop a module that would handle management of spa beauty. The online system that includes all the module of registration customers and services of the spa beauty to easily manage the data. 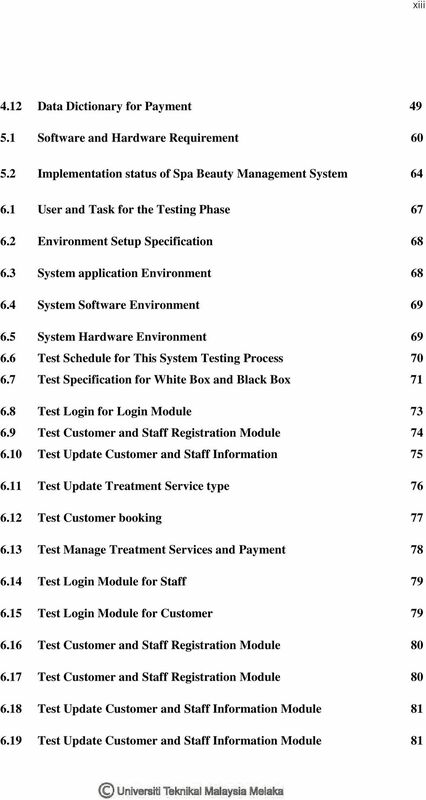 To computerized the management that help the staff improving the management of the spa beauty system. 24 3 Registered customer with username and unique password can do appointment for treatment and services via online. However, the payment for desired treatment and product need to do at the center directly. 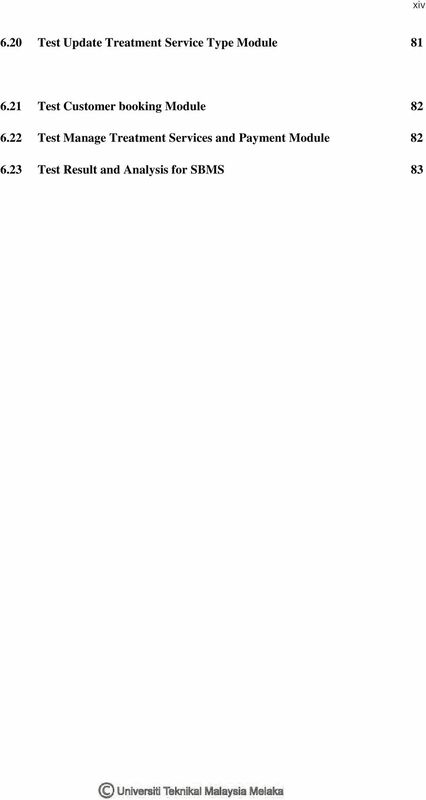 The payment details only will be stored at the system. To minimize the redundancy and loss of data. To develop online system that includes simple inventory. The main system in the inventory are maintaining treatment, product, payment and customer data. In addition, report can be generated and printed out. 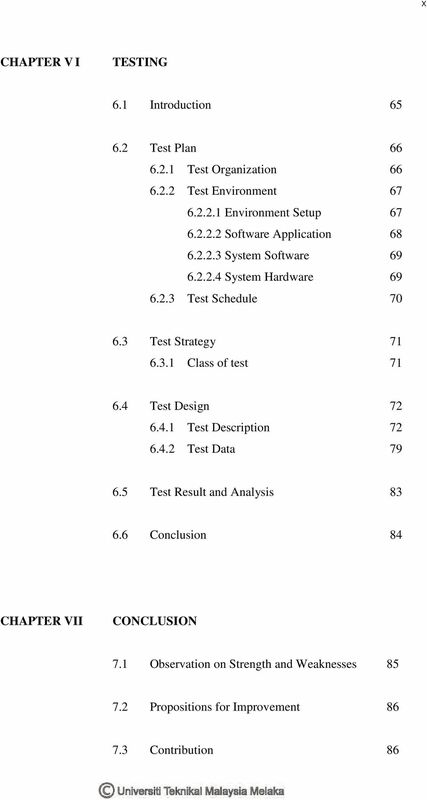 Sample reports are report by products, report by treatment and report by customer. 1.4 Scope Scope is an individual that involve in some module in SBMS User Customer and Staff are two main users for Spa Beauty Management System (SBMS). Each individual user s scopes are as follows: a. Admin/Staff 1. Manage new staff information 2. Manage customer information 3. Manage treatment/services information 4. Manage customer information 5. 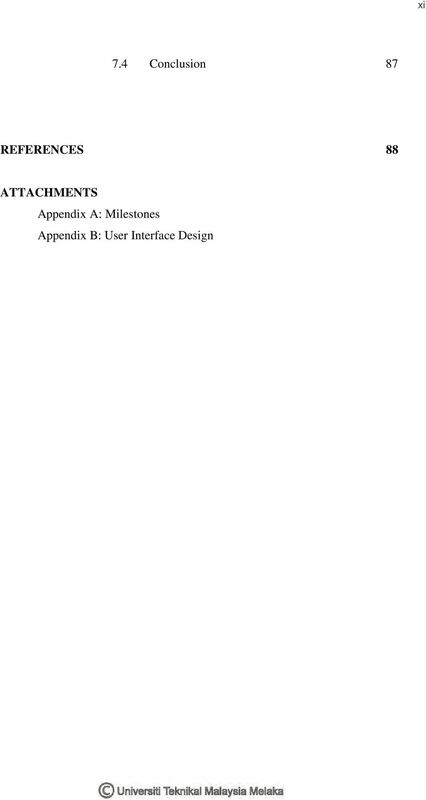 Manage payment information b. Customer 1. View available service treatment information 2. Register membership to do treatment services appointment.